According to a new report by OpenSignal, cellular network speeds have gotten faster and often greater than average Wi-Fi speeds. In 33 countries, smartphone users now experience faster average download speeds using a mobile (cellular) network than using Wi-Fi. The upshot is that cellular networks (some type of LTE) are no longer inferior to Wi-Fi in every country and the mobile industry must change a number of design decisions as a result. Australia smartphone users experienced the biggest advantage with average download speeds 13 Mbps faster on mobile networks than on Wi-Fi. The mobile network advantage for a few other countries: France (+2.5 Mbps); Qatar (+11.8 Mbps); Turkey (+7.3 Mbps); Mexico (+1.5 Mbps) and South Africa (+5.7 Mbps). In sharp contrast to the above, U.S. Wi-Fi is still 25Mbps faster than mobile networks on average. Same is true for Hong Kong, South Korea, and Singapore. Hong Kong’s mobile networks deliver average speeds that are 38.6Mbps lower than that experienced over Wi-Fi. Hong Kong’s mobile users experience an average speed over Wi-Fi of nearly 55Mbps, compared to just 15Mbps for its mobile network. In China by contrast, average Wi-Fi speeds were recorded at 23.9Mbps, compared to overall mobile download speeds of 13.8Mbps. 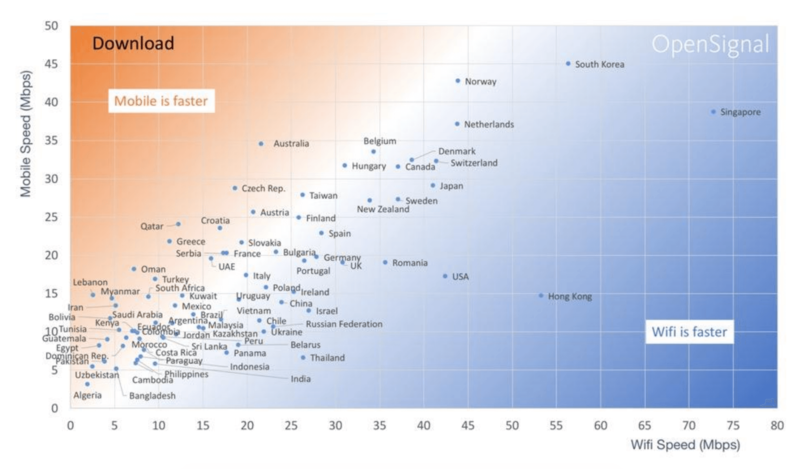 Of the Asia-Pacific countries studied, only Japan, South Korea and Singapore recorded faster Wi-Fi compared to mobile speeds, and the difference between the two was a lot closer in each market. South Korea recorded the fastest average mobile speeds of around 45Mbps, compared to 56Mbps for Wi-Fi, while Singapore had the fastest Wi-Fi speeds of 73Mbps, compared to around 39Mbps over Wi-Fi. OpenSignal states that telecom operators in markets where there is little difference between mobile and Wi-Fi speeds are using fixed wireless networks effectively to support their cellular networks. They also experience greater mobile network consumption as consumers in the market have little incentive to switch networks. With 5G coming in various flavors, cellular networking speeds are bound to get faster and better. However the next generation of Wi-Fi – IEEE 802.11ax or Wi-Fi 6 is designed for cellular data offloading to a fixed broadband wireless network. Hence, both technologies are meant to be complementary. Another interesting observation from the study is a mobile device’s tendency to favor Wi-Fi over cellular, even if the Wi-Fi connection is not as good (that’s my experience with a Samsung smart phone). With the exception of smart phones made by Huawei, most cellular devices will automatically switch from cellular networks to Wi-Fi without performing a speed test. Huawei phones will switch from a slow Wi-Fi link to a faster cellular connection where appropriate. We think the entire mobile phone industry should do this type of speed test and wireless network switching in both directions (Wi-Fi to cellular and cellular to Wi-Fi). This entry was posted in Mobile networks vs WiFi speed and tagged OpenSignal. Bookmark the permalink.